“So, you’re an art blogger. Tell me this: do bloggers really make any money?” I was asked by Jeremy Paxman, in his usual abrasive style, just yesterday at a lunch event for journalists. It took me a moment to reply, and I didn’t want to take too long. We all know how he berates University Challenge contestants for slow responses. I also liked him immediately for asking me what most people want to know. The question came at a good time. It’s been one of my best art blogger weeks (so far). That’s mainly down to the time of year. Autumn is always the busiest period in the UK art world. There are art fairs, like Frieze, filled with collectors and dealers looking to buy and sell. New shows open weekly: there’s too many to go to them all (what Instagram is for). Then, you have auction houses hoping to break records. Just think of the stunt pulled by Banksy at Sotheby’s this week. He picked his moment well. It’s the season when new influences, trends and artists emerge. This means, as an art blogger, it’s an ideal time to work with galleries, artists and other clients in between. So, just what have I been up to inside the art world? And how am I making money as a blogger? Here’s a private view into what I’ve been working on in the last week (*denotes paid work). * The week started well. 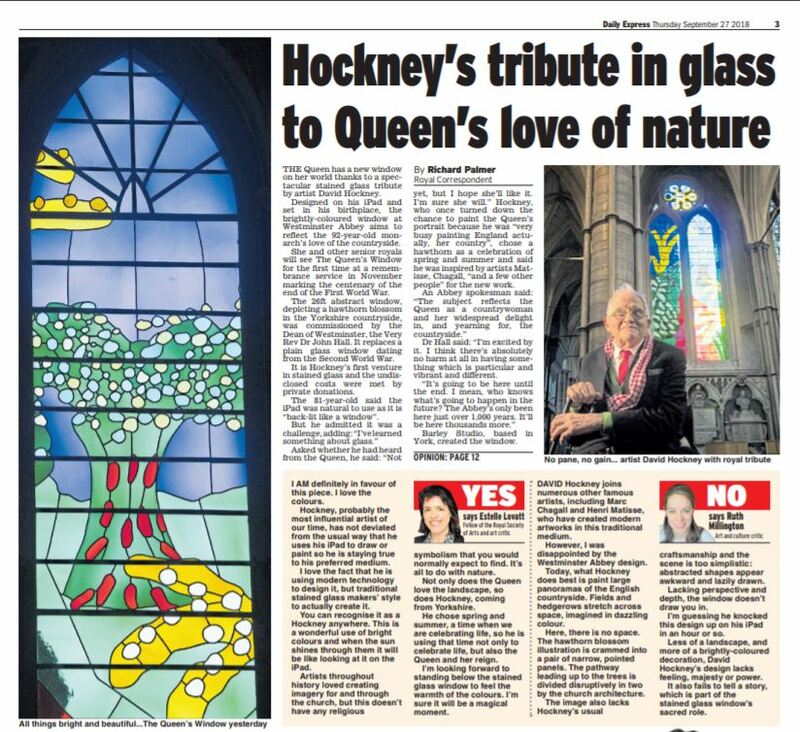 David Hockney was commissioned to design a stained-glass window for Westminster Abbey. And I was commissioned by the Daily Express to give my opinion in a comment piece as one of their art critics. I wasn’t impressed. But I was kind in comparison to many of the comments which followed. “It looks like a demented squid” was one of the best. You can read what I had to say here. I added to my own collection with a limited edition print by emerging painter Jay Taylor. I’d written about his ‘Dialogues of Distraction’ – he destroys his own paintings, and the results are incredible. It’s important for me to point out that I only write about and work with artists who I think are any good. 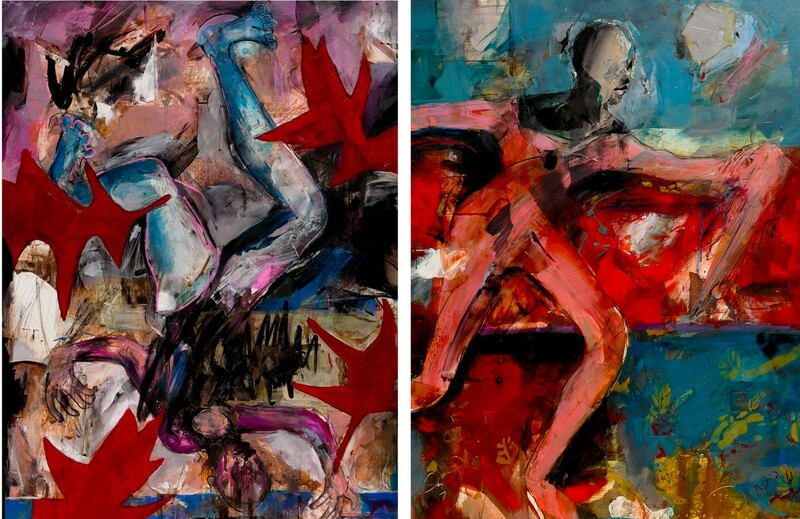 Jay Taylor destroys his paintings, before bringing them back to life. I added to my collection with one of his limited edition prints. I featured artist Suzie Hunt on my social channels. I first met and identified Suzie Hunt as an artist to watch at her fine art degree show at BCU in 2017. Now, she has an exhibition at Birmingham Museum & Art Gallery. So, huge congrats Suzie! She’s another artist in my own contemporary art collection. Most of the money I make from art blogging is spent on art: it’s on my walls, under the bed and perched on bookshelves! And I always like to support new artists where I can. * I‘ve also been busy planning an art party at Jailbird (a New York cocktail bar on Colmore Row). This has included researching Surrealism for a ‘Surrealist Halloween Party’ on Wed 31 October, so save the date. I am very partial to their cocktails, so much of this work has been done with an Espresso Martini in hand. I started a new art class. I don’t think that you can write well about art unless you’re also making it and understand the processes. And my printmaking course at MAC has increased my respect for printmakers. My artworks have been described by the course leader as ‘vigorous’ and, sadly, I can’t see them in an exhibition any time soon. I’d better stick to the writing and art blogging, but the class is a great way for me to unwind. Looking for an art class of your own in Birmingham? Look no further: here’s my guide to the best art and craft classes in the city. I was invited to judge an art art show at the RBSA Gallery. The exhibition was based on the theme ‘Inspired by Words’, which resonated with what I do, and I was excited by much of the work. I chose Cristina Celestini as the winner, for her moving portrait of her daughter about to leave home for university. Cristina had responded to Shakespeare’s Twelfth Night, telling the story anew for a contemporary audience. 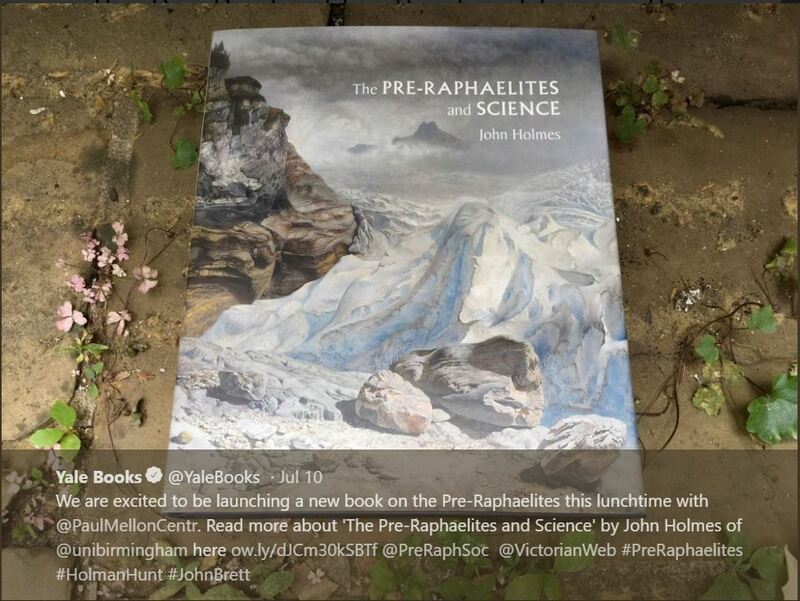 I reviewed Professor John Holmes’ brilliant new book: The Pre-Raphaelites and Science. I thought there was nothing new to say about the Pre-Raphaelites, but this book proved me wrong. It shows how these artists put scientific principles into practice across art, poetry and architecture. They decorated natural history museums as temples to God’s creation. At the same time, journals like Nature considered Pre-Raphaelite art theory alongside Darwin’s theory of evolution. With fantastic illustrations (and reinterpretations) of well-known works by artists such as John Everett Millais, William Holman Hunt and Dante Gabriel Rossetti, it’s a coffee table book worth reading. * I met with academics at a number of universities, as I am going to be teaching several modules on digital art history, and helping students to set up their own art blogs. Thinking of starting an art blog? Why not head over to my advice on how you can do this, with my 12 steps to success. 10. Birmingham Blogger of the Year? I also found out I had been shortlisted for Birmingham Blogger of the Year (thanks to whoever it was who nominated me!). Art and culture is up against lifestyle, food and mummy blogs. Want to vote for me? Well, you can do that here! 11. Banksy: did Sotheby’s know? To top it all off, my best friend hung the Banksy which self-destructed at Sotheby’s. If I tell you the truth about what happened, he might lose his job. But you can watch the footage here. I didn’t manage to tell Mr Paxman quite ALL of this in my answer. But our conversation ended with him wishing me luck with the art blog: I’ll take that and run! I forgot to tell you this morning, when I spoke to you on the phone, that I also blog on Art in Jot 101. I worked closely with John Piper for several years, as he was the General Editor of the Shell Guide series, and back then I was writing the Guide to Hertfordshire. In fact I am the only surviving Shell Guide writer ! At the moment one of the items that my employer, Nigel Burwood, sent me to write on in Jot 101 is a very, very sensitive document that I cannot even mention here. Suffice it to say that it is diary of a living art dealer. Nuff said.